Comedic takes on Arthur Conan Doyle’s legendary sleuth and his cool-headed sidekick are nothing new. All the way back in 1924, Buster Keaton portrayed a lowly projector yearning to be the famous detective in Sherlock Jr. Billy Wilder’s The Private Life of Sherlock Holmes was about the rare cases where the pipe- and cocaine-obsessed genius crime solver failed. Gene Wilder’s The Adventure of Sherlock Holmes’ Smarter Brother was about Sherlock’s loser bro trying to impress him by solving a case. 1988’s Without a Clue posited the premise that Ben Kingsley’s Watson was the true detective, with Michael Caine’s Sherlock actually a clueless actor Watson hired so he can operate freely. Those are some of the good ones. Like the stunning misfire that is Holmes & Watson, there are many terrible examples as well. A Sherlock Holmes comedy seems to work best when paired with a premise that subverts the tried and true formula attached to Doyle’s characters. 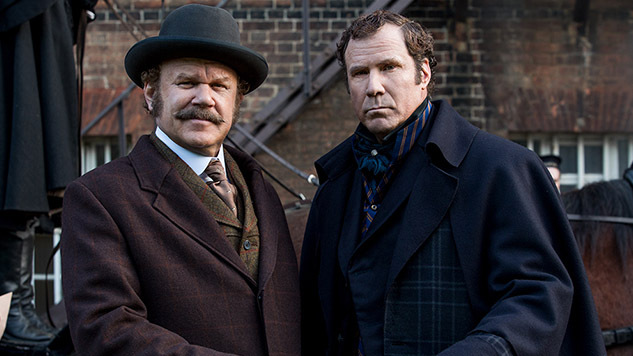 The first big mistake Holmes & Watson makes is to simply pitch Will Ferrell and John C. Reilly in the roles of Holmes and Watson, respectively, and call it a day while expecting the duo to serve instant comedy gold. Sure, they were a hit with Talladega Nights and Step Brothers, but those Adam McKay classics made sure to first deliver a narrative foundation with fully formed characters and well-established conflict before letting Ferrell and Reilly loose. In Holmes & Watson, director Etan Cohen is also credited with the screenplay, but this mishmash of low-rent Funny or Die skits look like it was cobbled together by dailies full of mismanaged improv without any sense of the overall tone and vision for the project. This duo is fearless and immensely creative when it comes to improvisation, but when they’re obviously not given much to work with, even the most inspired line or gag falls flat against the whole. The plot is as generic a Sherlock Holmes tale as it comes: With Holmes’ arch nemesis Moriarty (Ralph Fiennes) escaped to the USA, an apparent copycat threatens the life of the queen (Pam Ferris), so now it’s up to Holmes and Watson to solve the case and save England. The expectation from Cohen is to mold a funny take on the famous sleuth to spice up this flat premise. Unfortunately, Cohen, or no one else in the production it seems, had any idea what that humorous twist would be. The opening scenes with Holmes as a child sets up how he left behind any feelings and led a life of pure logic after being bullied. This could set Holmes as a consummate straight man, a parody of the humorless Benedict Cumberbatch version, with Reilly’s buffoonish Watson as foil. It’s hard to see Ferrell as the quiet bastion of emotional control, but it could work considering his pedigree with dramatic work. Yet this idea is immediately abandoned as the adult Holmes is presented as a narcissistic prima donna, an emotional wreck who’s the exact opposite of what was set up just two minutes prior, who’s late to his big courtroom reveal because he can’t settle on a perfect hat to wear. Fine, let’s go with that version of Holmes and Watson; it’s not as if Ferrell and Reilly are strangers to playing stubborn man-babies. But in the next scene, Ferrell and Reilly split Peter Sellers duties as 19th Century England versions of Inspector Clouseau who unleash a swarm of bees into their office while trying to kill a deadly mosquito. Jump from here to a parody of Robert Downey Jr.’s superhuman Sherlock, calculating every single possible upcoming move as time slows down and the frame is filled with scientific-looking gobbledygook. Instead of settling on cohesive characteristics for Ferrell and Reilly to inhabit, Cohen seems to take every single idea for a Sherlock Holmes adaptation and throw them all at the audience to see if any stick. Not that many of the “sketches” work on their own, either. Most of the jokes simply fall flat because they are mere premises without context. For example, there’s a bizarre running joke about Watson being uncontrollably sexually attracted to the elderly queen. Rather than parody England’s blind reverence for its matriarch or link it to the idea that any person in the 19th century making it to old age is a sign of vitality, the joke doesn’t seem to be based on anything other than Cohen thinking it would be funny to see a middle aged man hit on an old lady. There are attempts here and there to provide some satire about how backwards science and culture was in Sherlock’s time, but they end up as torturous repetitions of the same jokes: Isn’t it funny how Watson’s solution to every ailment is cocaine? How the two male protagonists can’t possibly fathom Rebecca Hall’s vastly underutilized supporting character being a doctor? Because it’s the 19th century and everyone was a misogynist. Get it? There’s one hilarious joke involving telepathy, but it’s nowhere near worth enough to make the trip to the theaters, let alone pressing the button for streaming when the movie comes out on VOD. Considering Ferrell and Reilly’s immense talents, Holmes & Watson is an even more unsettlingly unfunny experience. If this was one of those straight-to-Netflix flicks starring Adam Sandler and Rob Schneider, at least it could be disposed of easier. But apparently even Netflix refused to buy the film from Sony after it tested horribly. Why shell out ticket money for a movie that was deemed too terrible for a home streaming platform that greenlit The Ridiculous Six?